Today, I went to the Upper East Side, as I’ve promised from the last post that I’m going to Two Little Red Hens. I have two reasons in mind for this visit: (1) it’s been 2 years since I’ve been here (2) I want to try their Brooklyn Blackout Chocolate Cupcake and a muffin since I’m doing “research” for a future posting. The bakery has a very charming and homey atmosphere. The window’s decorated for Christmas and their bakery was a little behind on the morning’s muffin rush because as one of the staff members told me that the bakers were rushing in the cake orders from the night before. I don’t have a grudge against that. Totally understandable since the holidays are coming. 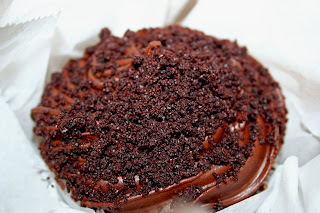 So all I did was order their highly acclaimed Brooklyn Blackout Chocolate Cupcake, which cost me $4. Cupcake nestled in a box of waxed paper. I just sat down and lingered there for a while, taking photos of the place, watching people watching, and listening to tunes of Simon & Garfunkel playing from the bakery’s speakers. Eventually, when another person asks for a muffin, they finally checked in the back for the coveted muffins. Voilà, a basket full of freshly baked muffins. The flavors available for today was blueberry lemon, cranberry, pumpkin, and something else. The only thing that attracted me was the pumpkin. The muffins cost $2, by the way, and I ate it. 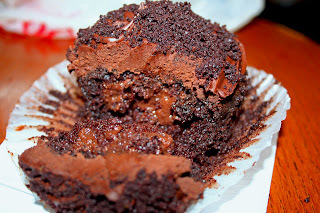 I’m not going to talk about much on this muffin because I’m going to write about it in detail in a week or two; so stay tuned if you want to know. It’s bustin’ out with tons of chocolate! 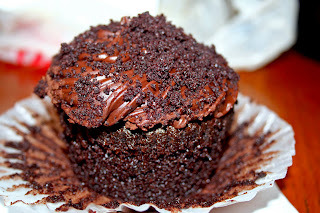 This cupcake is large enough to share between two people. I am just the greedy chocoholic, so I finished the whole thing. 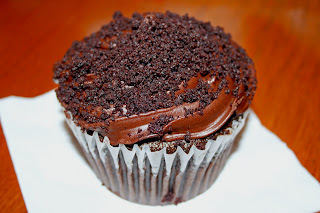 After I finished this fabulously delicious cupcake, I walked it off a bit to Lexington Avenue for some espresso. I need caffeine and something bitter to counteract all the sweets I’ve just consumed. I remembered a good place for espresso drinks within a twenty so block distance, called Sicaffe. Sicaffe opened a few years ago, when I remembered reading about it in NY Magazine and I paid a visit there. Basically, today seems like a day of revisits to places I haven’t been in a while. So, when I arrived there, I ordered their signature espresso drink, Triestino Dopio for $3.64 with tax. It’s the closest thing to a real Italian espresso. It’s smooth, dark, robust and syrupy espresso with a thick, creamy, foamy top (note that it’s whole milk I’ve ordered). It’s been a good morning, as a breakfast of sorts. Not healthy but the food and drink was spot on. To see more photos, just go to my Flickr gallery. I love your pictures on Flicker! gagatka – Thank you so much. They’re both divinely good and delicious. You can’t go wrong with both as a dessert or in my case, breakfast. ohhh wow the pictures are amazing I would love to go. we should get together this break and go on a chocolate hunt. ^.^ What days are u free.